I love handmade gifts and I try to give them whenever possible. But this year for Mother’s Day, I was stumped on what to do for my Mom. I stumbled upon this idea and knew it was perfect!! My Mom is a huge bracelet person and loves her Granddaughters more than anything else. I love this idea so much and I’ve been dying to share it! 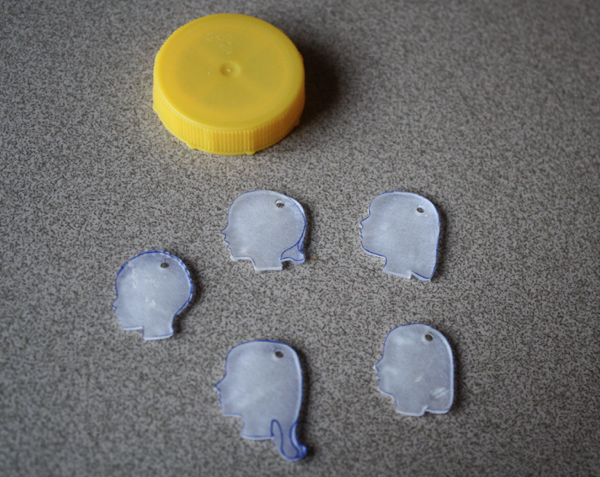 It comes with 5 sheets of 4×6 Shrinky Dink plastic, a hole punch, 2 chains and some jump rings. But I wanted nicer and slightly larger jump rings, so I picked some up at Michael’s, where I also found the bracelet. 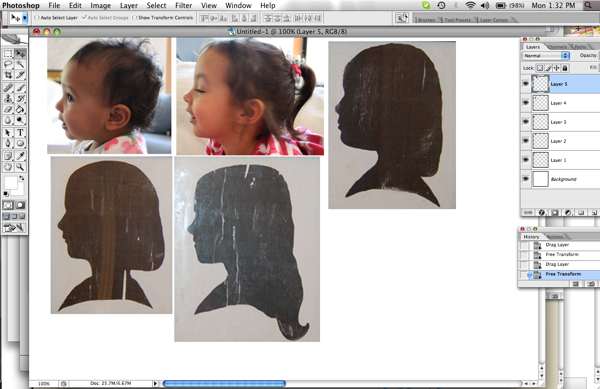 To make the images, I took pictures of my girls, and used the silhouettes my sister had taken of her girls. I loaded them into Photoshop (there are many picture editing sites you can use for this, and if nothing else, open the images in MS Word and change their size) and adjusted each head so it was approximately 2″ by 2″. 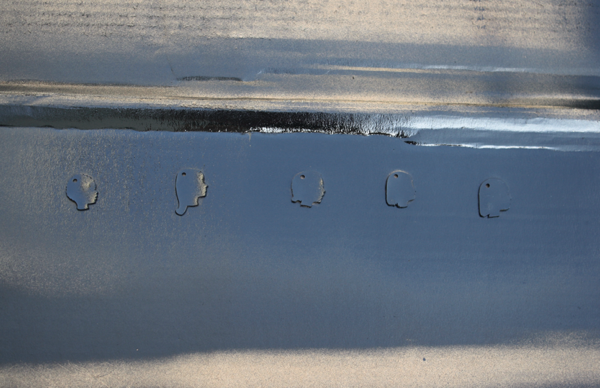 Then I used a regular pen, and traced them onto the textured side of the plastic straight off my computer screen. 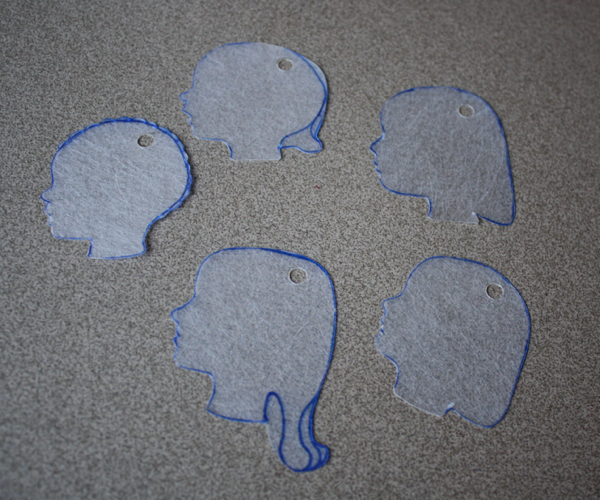 I used 2 sheets for all 5 heads (and had some left over on the second sheet). I changed their hair some to fit my idea better, and I made stumpy rounded-off necks so the silhouettes wouldn’t have sharp edges. 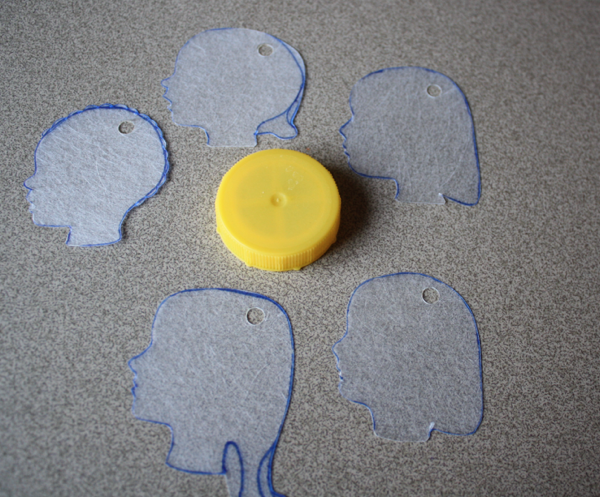 Then I cut them out on the lines and punched holes at the top of their heads. The leftover pen marks don’t matter because they’ll get painted. And for size reference, with the top from a gallon of milk. 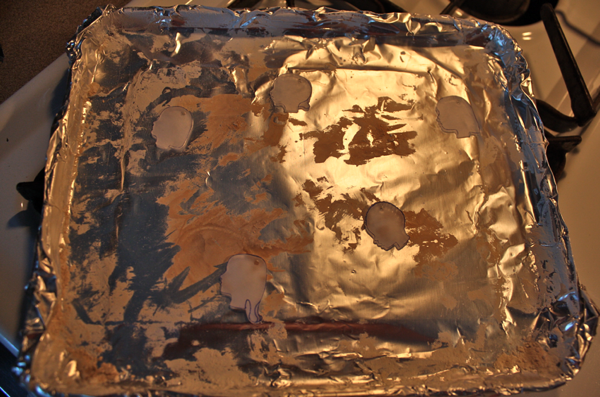 Then I lined the tray from my toaster oven with foil, sprinkled some corn starch on it, and stuck all 5 Shrinky Dinks in at once. It took them about 20 second to shrink up and lay flat. Then I removed the whole tray and let them sit about 10 minutes to harden and cool. Trust me, you have to wait about 10 minutes before you try to move them!! I got all excited on my test round and tried to lift it immediately and it was a complete disaster! And again, with the milk lid. Boy they really shrink! then waited about 15 minutes, flipped them over and painted the other side. 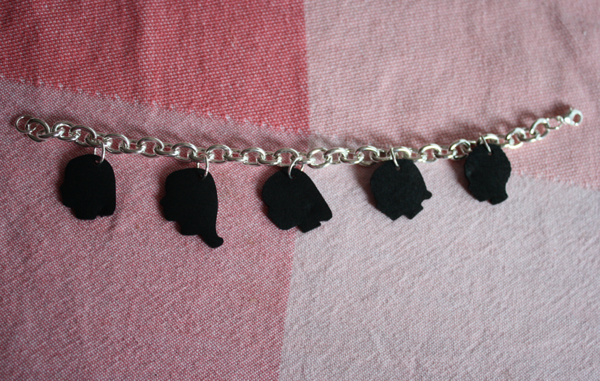 I waited about an hour for them to dry really well, then I attached them to the bracelet with the jump rings. I did it all with my fingers, no additional tools necessary! Then I fawned over their tiny little profiles in excitement, hardly able to keep it a surprise from my Mom! This project is fast, simple, and extremely inexpensive!! 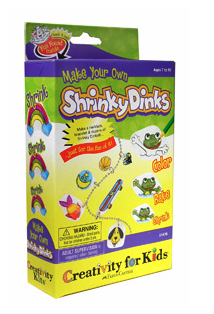 I used my 40% off coupon at JoAnn’s, making the Shrinky Dink kit $3. The bracelet was $2.99 at Michael’s in their jewelry section (called Jewelry Essentials chain and is 8″ long). The jump rings were also $2.99. I used 9mm rings and there are 85 in a package. I also used a 40% off coupon at Michael’s and it just happened to take it off the jump rings, making them $1.79 (or $.02 each). 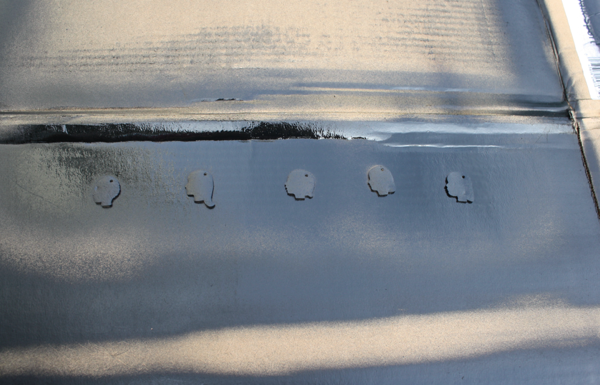 But when you break it down further, I used 2 out of the 5 sheets of plastic, for a cost of $1.20. The bracelet remained the same price, and I used 5 jump rings for a total of $.10. So out of pocket, this priceless gift cost me $4.29 to make and only took about an hour!! And my Mom LOVED it! Happy Mother’s Day, Mom! 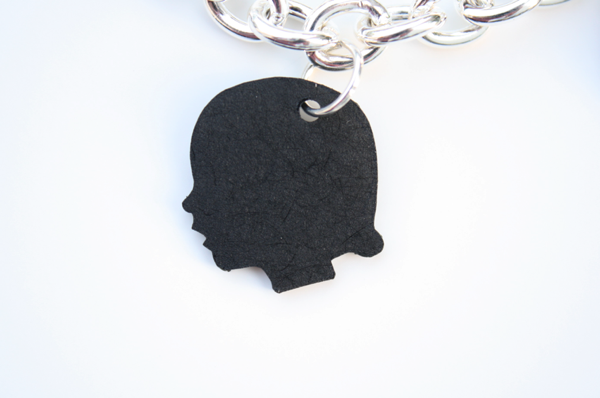 I can’t wait to add our 6th little profile to your bracelet! I LOVE this bracelet and can’t wait to show it off to all my friends. Everyone who knows me knows that my granddaughters are my pride and joy. Now I can have them with me everywhere I go. Thank you, Sweetie, for such a thoughtful, fun gift. I will cherish it. You always come up with the most creative and thoughtful gifts! My parents made me a shrinky dink bracelet for Christmas when I was about 10–in the 70s. It had our phone with our number on it, my red bike, a piece of pottery, a roadrunner, etc. I still have it and love it! Very cute idea! Just wanted to let you know that our Joann’s and Michael’s carries Shrinky Dinks plastic sheets in the stamping and scrapping section. At Michael’s you can even get black or colored plastic! I’m not sure if your sister looked in that area of the store. I only know where it is because I couldn’t find it one time and I asked a store clerk for help. She didn’t know and asked another clerk who had been at the store forever. She knew where everything was in that store. I love your website. Thanks for sharing your ideas. I popped over from The Long Thread and really enjoyed the tour of your blog. You have fun projects.